Tile has been a choice in home design for hundreds of years. But, that doesn’t mean that tile can’t get dated. Because flooring is such a huge part of design, switching up your tile could mean a whole new look for your entire house. If you are thinking of renovating your flooring and wanting to go with tile, consider these new tile trends seen in home design. OK; so subway tile has been around for generations. But, that’s just a testament to how resilient the design of subway tiling really is. Standard subway tiles are 3×6 inches and white. This design is commonly used on bathroom flooring and shower tiling. Today, subway tiles can be purchased in different sizes, whether larger or smaller. Additionally, consumers aren’t restricted to the common white coloring. Currently, subway tiles of all colors are considered new tile trends. And, subway tiling isn’t restricted to bathrooms. Consider this trend as an option for a kitchen counter backsplash or in your laundry room for a fresh and classic design. Patterned tiling creates a standout design that can give a room its character. Whether you decide to utilize patterned tiling as a focal point of a room or for the entire flooring, it can change the whole feel of a room. If you’re wanting your tile to make a statement, patterned tiling is the best way to go. With millions of patterns, colors, and textures to choose from; you may not be able to make a decision right away! Although a tile trend for a few years, porcelain tiling made to mirror the look of wood floors are still a popular choice. This option is great for homeowners who would otherwise be unable to purchase wood floors due to high moisture levels or highly rough use. Porcelain is a stone which guarantees many years of damage-free use. And, with a wood finish, provides a beautiful appearance which matches any home decor. Porcelain tiling mirrored to look like wood flooring also comes in a variety of colors that may not be available to classic wood floor buyers. Along with offering options for porcelain tiling with wood design, porcelain tiling also comes in a brick design. This flooring is great for individuals who want to incorporate the red brick look into their home without having to actually lay brick. Brick options come already whitewashed or to match the classic red brick style. 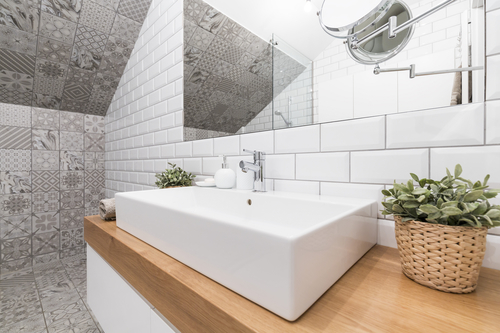 Thinking of doing a renovation and incorporating new tile trends into your home? If so, leave the mess to us at Dustbusters. Removing tile can be a strenuous, time consuming, and frustrating process for the do-it-yourselfer. Not only does the process include chipping, scraping, and hauling away heavy and sharp tile pieces, but it also comes with a fair share of dangerous dust. By investing in a dust-free professional tile removal service, you leave all the dangers and mess of a tile renovation to us. With our innovative system, harmful dust caused by tile removal is sucked up before it can even release into the air. Additionally, our professionals know how to remove flooring, grout, and thinset quickly and perfectly. This leaves you without having to extend your project timeline to conduct back-breaking tile removal yourself. Lastly, removing tile yourself means investing in a costly dumpster service. This is because most garbage removal services will not pick up renovated items, especially heavy tile. By utilizing our services, you won’t have to move a muscle as we also take care of removing demolished materials off your property. If you’re ready to start your tile renovation process, give us a call at Dustbusters today! Let our dust free tile removal technology handle your old tile so that new flooring can be installed the next day!